Mum is visiting and I want to make dessert magic for her. But, I'm no baker. I'm not a fan of following recipes, never mind being precise with them. So how do you get around this? You pick puddings to make that are lenient on your non-exactness, ones that will be forgivably accomodating and turn out irresistibly tasty too. Flapjack. What a wonder eh. It's a New Moon also, and Mum and I have got into a tradition of planting our intentions for the coming month (or sometimes longer) around this time. 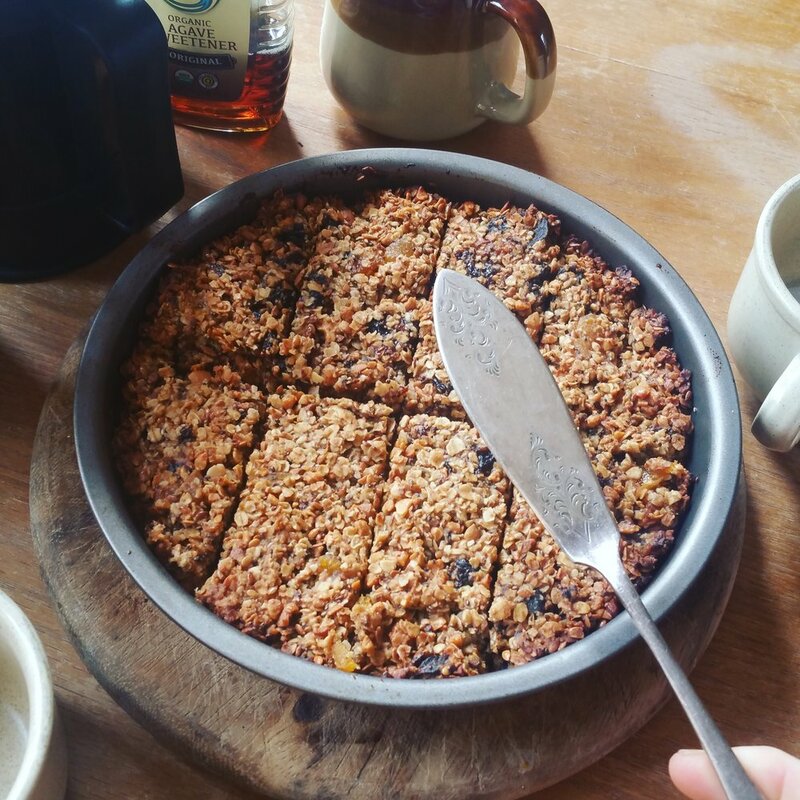 So, we thought we would come up with our intentions whilst mixing the flapjack, then when we devour it later, we will be planting those wishes deep into our insides! So we will be focusing on how to prepare the ingredients and what order to put everything together rather than exact measurements... you get to improvise this yourselves! Much more fun. Pre - heat your oven to 200 degrees. In a bowl put the cashews, linseed and chia seeds and drizzle with some melted coconut oil. Stir, then place on a baking tray and roast for 10 minsutes. They should be nicely browned when you take them out. Chop the fruit up, there was roughly about 5 tbsp of it in total. Put in the bowl and lightly coat with the flour, then mix for a bit. This breaks up all the chopped pieces instead of them sticking together in a big clump. While you're chopping and prepping, if by yourself then start thinking about the coming month, what you would like to work on, what your dreams are, there is no limit to what you can wish for! If you're with somebody else then have a chat about what your intentions might be. It can be very inspiring and thought provoking to hear someone else's heartfelt wishes, and might make you think of things you hadn't yourself! Begin jotting these down. If you'd like to read more on Intention Setting then head to The Little Sage. In a food processor, whizz the nuts and seeds so they are roughly ground. Add to the bowl and stir. Scatter a good amount of oats into the mixture and stir. Then add the agave syrup and melted coconut oil and stir until it all starts sticking together nicely. Mum and I took turns stirring the bowl and thinking about our intentions, how it would feel for them to come true, seeing what it might look like. Then we read them aloud for extra manifestation power! Ok, back to baking. Grease your baking tin with coconut oil, then spoon the mixture in a smush or flatten with the back of a spoon or spatula. Bake at 180 degrees for 12-15 minutes. Cut whilst warm.